As you know, the new tax legislation has significant impact to your clients across multiple filing types. We know when there is a major change in tax legislation that you will need to spend more time helping your clients understand the impact. Providing a printable summary that can be presented to your clients. Scheduled to be available January 31, 2018. The Tax Reform Impact Summary will assume the exact same tax situation as the prior year, including qualified dependents, dispositions, depreciation deductions, etc. In order to model other tax situations, the Lacerte Tax Planner will need to be utilized. The Federal Estimated Tax Worksheet has been updated with the 2018 tax rate and law. 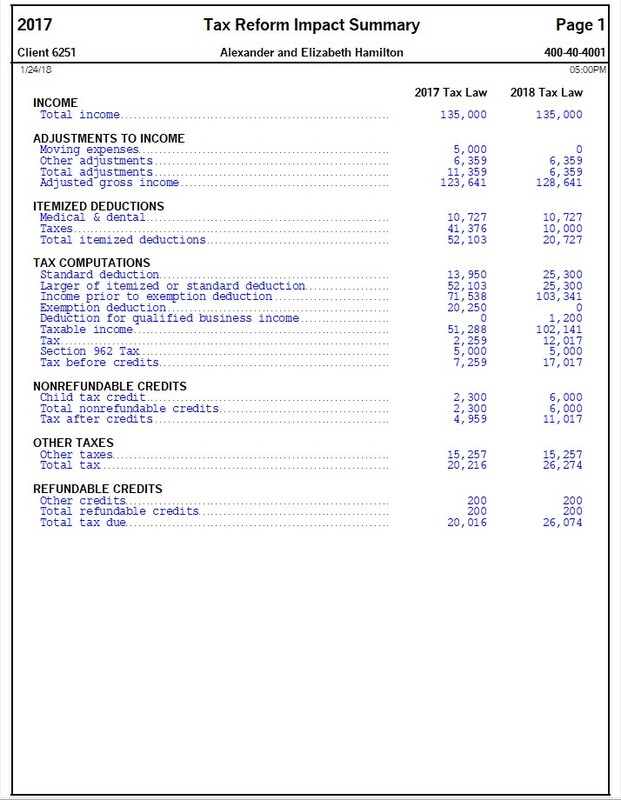 Use this worksheet to adjust income, deductions and withholding for 2018 changes and prepare quarterly estimates. The QBI deduction will also be incorporated into the worksheet IF you elect to use an estimated tax method that includes the 2018 tax liability. The Lacerte Tax Planner is used to present multiple tax scenarios when planning for the next tax year with your clients. The Tax Planner will be updated to include all applicable tax law changes if and when legislation is passed into law by January 31, 2018. Click here to view helpful Tax Planner FAQs. We sought feedback from several of you, and as a result, are developing several programs in support of you and your clients for this transition. We created the Tax Reform Resource Center as a single source for tax law updates, education, and the latest news and blog articles. You will also begin seeing continuing education webinars to support the tax law changes, updated Tax Planner training, and tools summarizing the tax law to share with your clients.